I read a story in the late 70s about a man who travels to another dimension and finds himself on an alien desert planet with giant carnivorous plants. The plants have teeth-ringed mouths on the top of their trunk and long feelers to grab prey. I think they eat one guy and pull out his guts. Can anyone help me remember the story’s name? Giant carnivorous plants are a common feature of science fiction, and authors commonly endow them with tentacles to grab prey. I haven't found an exact match for your story but you say it's an old story and you mention travel to another dimension, and this immediately makes me think of Clark Ashton Smith or others writing in the same style. He was inordinately fond of adventures in other dimensions - frequently eldritch dimensions. Adams ventured to take a step forward. Instantly a long tentacle shot out from the nearest of the kraken-like forms and encircled him. Struggling and screaming, he was drawn toward the great dark lumpish mass from which the tentacles emanated. There was an open cup-like mouth of vermilion, fully a yard wide, in the center of this mass; and before his companions could even move, Adams was thrust into the mouth, which forthwith closed upon him like the mouth of a tightened sack. Roverton and Deming were petrified with horror. Before they could even think of stirring from where they stood, two more of the tentacles shot out and gripped each of them about the waist. The grip was firm as an iron rope; and both were conscious of a sort of electric shock at the contact—a shock which served to stun them still further. Almost fainting, they were held erect by the horrible coils. 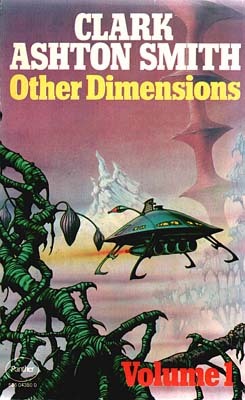 Even back in the 1970s Clark Ashton Smith's stories were mostly found in anthologies, and I wonder if you might have read the story in an anthology and conflated it with other stories of his about different dimensions. It's a long shot ,but I thought it worth a try. Not the answer you're looking for? Browse other questions tagged story-identification books aliens . Short story about space traveller who runs afoul of bee-like aliens who collect knowledge?